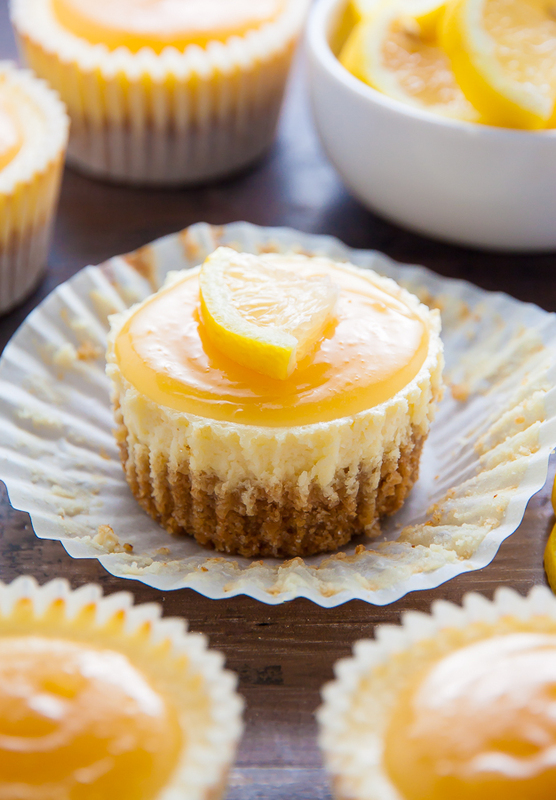 Sweet and creamy Lemon Ricotta Cheesecake Cupcakes! Everything you love about lemon cheesecake, but in mini form. 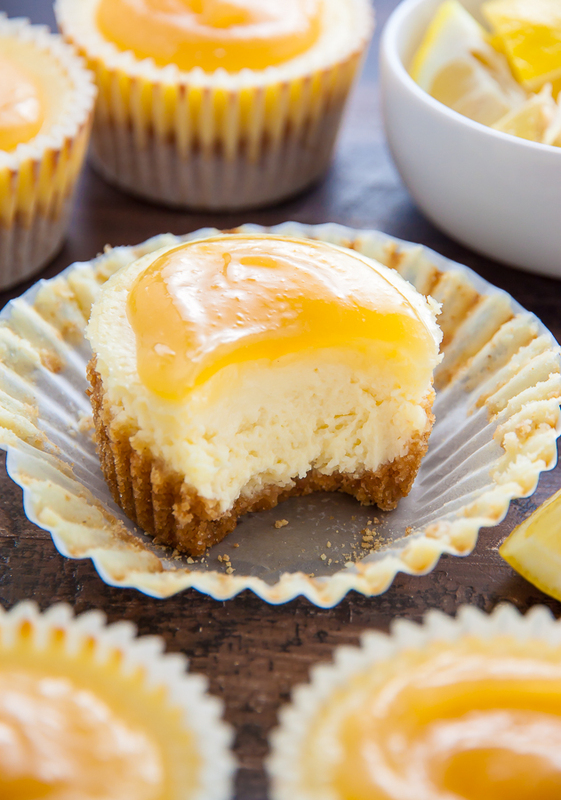 Made in a muffin tin, these Bite-Sized Lemon Cheesecakes are so easy and always a crowd-pleaser! Hello, friends. Hello, Saturday! What’s going on with you? Any fun Father’s Day plans in the works? After I finish this post (and another cup of coffee!) I’m packing a bag, hopping in the car, and heading home to Philly for a few days. Graduation parties, a BBQ with dad, and a Phillies game are all on the agenda. Hallelujah for long Summer weekends! But before all that, let’s share some dessert! 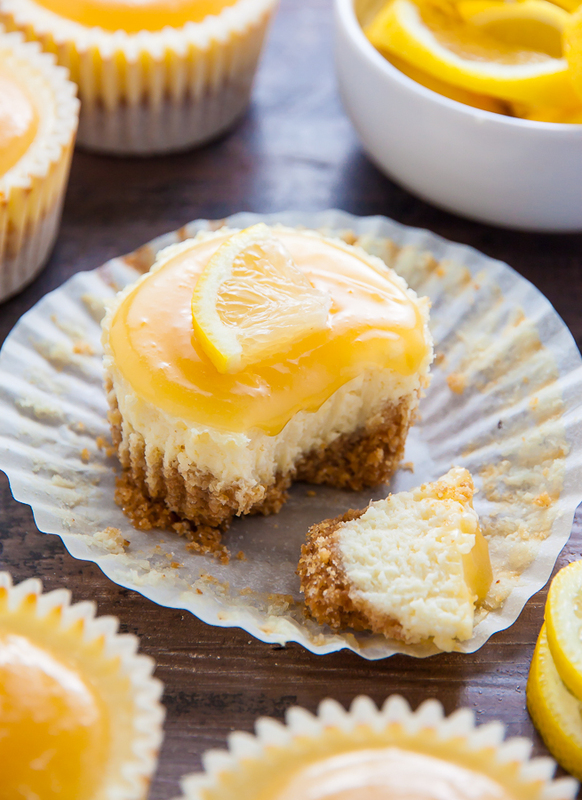 Today I’m switching up the way we eat cheesecake via my newest obsession: Lemon Ricotta Cheesecake CUPCAKES. Tiny in size and huge in flavor… I seriously cannot get enough of these little cuties. I’ve been a lover of all things lemon ricotta for ages now. You’ll find lemon ricotta pancakes, lemon ricotta cupcakes, and even a full-sized lemon ricotta cheesecake all hiding in the recipe archives. Drawing inspiration from all of those fabulous recipes, I created these lemon ricotta cheesecake cupcakes as an option for those craving cheesecake without all the chaos. 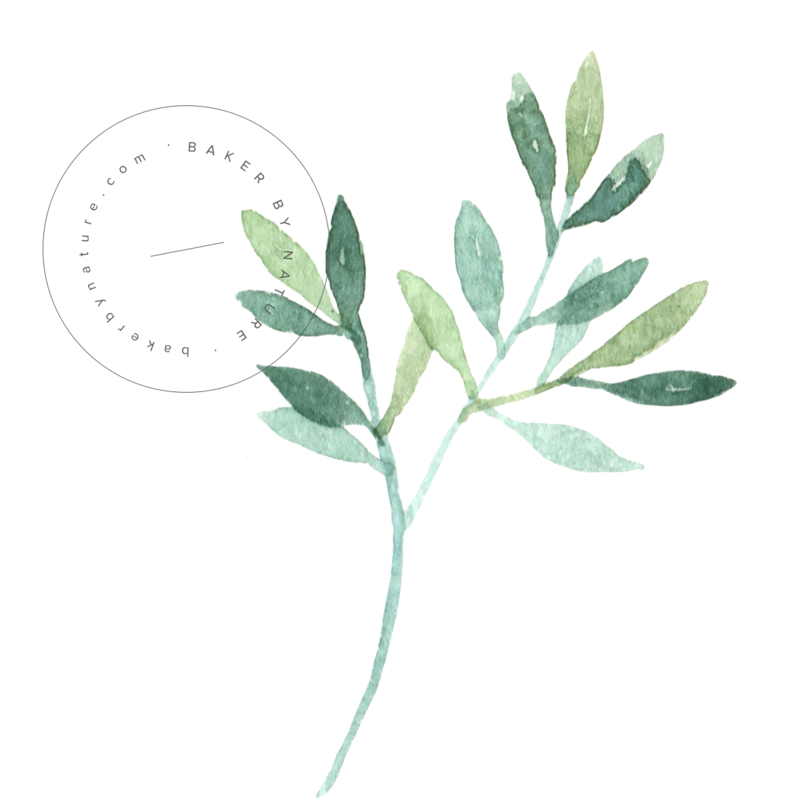 Cause let’s be real… sometimes we just don’t feel like busting out the springform pan and building a water bath. And that’s OK! Your blocks of cream cheese MUST be very soft and at room temperature before you make the batter. I suggest placing them out on the counter for at least two hours before you plan on baking. If you attempt to blend cold cream cheese it will clump up and won’t develop into a smooth batter. It also may harm your blender or food processor, so don’t attempt to use cold cream cheese. You should also bring your eggs, egg yolk, and ricotta cheese to room temperature, as batters made with cold ingredients don’t come together smoothly. The lemon juice and zest adds a very subtle but lovely pop of citrus to the cheesecake bars. If you prefer, you may substitute an equal amount of orange juice and zest. The lemon (or orange) juice is essential to the texture of the cheesecake, however the zest may be left out completely, if desired. Be sure not to over bake your cheesecake cupcakes. While I’ve included a bake time in the recipe box below, all ovens run a little different, so keep an eye on your mini cheesecakes as they bake. You’ll know they’re done when the centers have puffed up but still have a slight wiggle. Also, don’t fret if a few crack. They deflate quite a bit after they cool, and any remaining cracks will be covered with lemon curd. 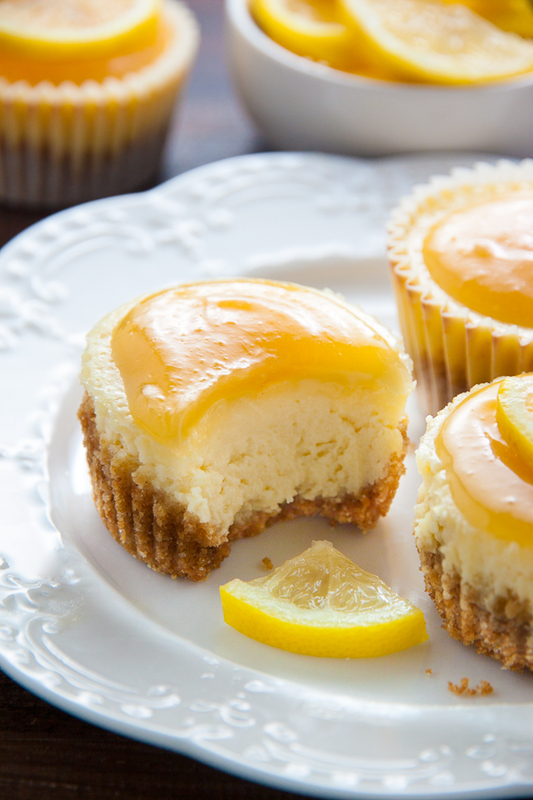 Be sure to cool the cheesecake cupcakes completely before adding the lemon curd. If the cheesecake cupcakes are even a little hot, the curd will melt and make a mess. This recipe yields one dozen lemon ricotta cheesecake cupcakes, but doubles like a dream. You can also make this recipe up to 5 days in advance!!! Making it perfect for parties and celebrations. I made 5 dozen of them last week for a family event and let me just say being able to make them in advance was a life saver! 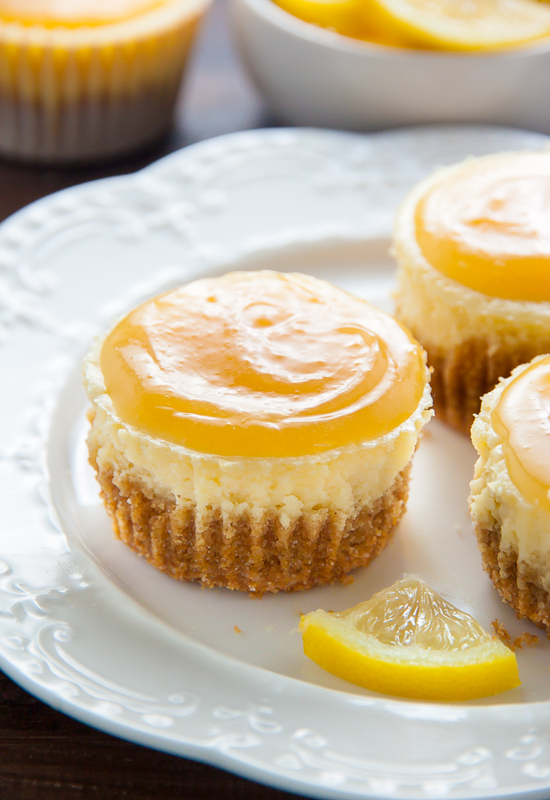 Lemon Ricotta Cheesecake Cupcakes topped with Lemon Curd! Perfect for parties and celebrations! In the body of a blender or food processor, combine graham crackers, sugar, and salt; pulse until the crackers have been completely transformed into fine crumbs. Add melted butter; stir well to combine. Add 1 heaping tablespoonful to each lined muffin cup. Press the crust firmly into an even layer. Bake in preheated oven 5 minutes then remove from oven and set aside to cool. In the meantime, make your filling. In the body of a high power blender, food processor, stand mixer fitted with the whisk attachment, or in a large bowl using a hand held mixer, beat the softened cream cheese and Ricotta cheese until smooth. Add sugar and vanilla and beat smooth, scraping down the sides and bottom of bowl as needed. Add in the eggs and yolk and beat until combined. Turn the mixer off and, using a rubber spatula, gently stir in the flour, mixing just until combined. Stir in the lemon juice and zest, mixing just until it's incorporated in the batter. Divide the filling evenly among cups - pouring it on top of the prepared crust layer - adding about 1/3 cup to each mold. The molds will be very full. Gently wiggle the pan back and forth to level the cheesecake filling. Bake in preheated oven for 22 to 24 minutes, or until cupcakes are puffed, set at the edges, and just a little jiggly in the center. Turn oven OFF and cool cheesecakes inside the oven, with the door cracked, for 5 minutes, before removing. Cool cheesecake cupcakes in the pan, placed on top of a cooling rack, completely, before transferring them to the refrigerator to chill for at least 4 hours. 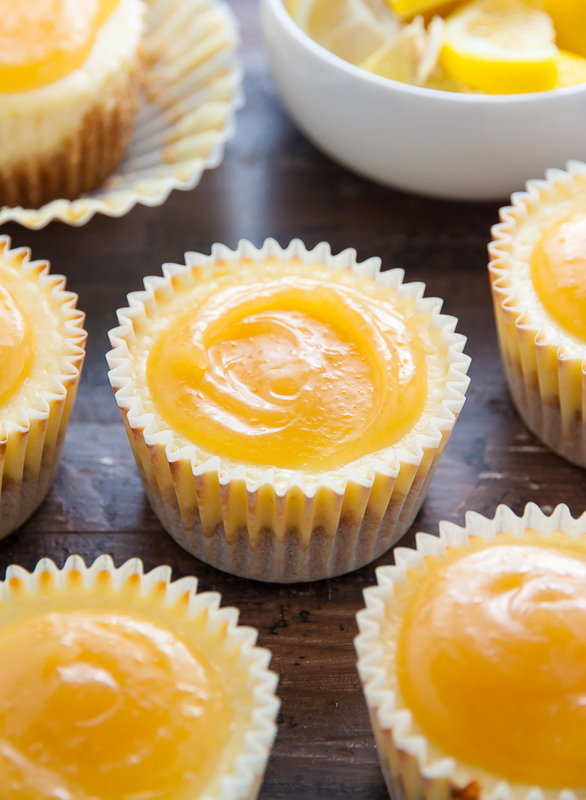 Once cool, top each cheesecake cupcake with a teaspoon of lemon curd. Store in the refrigerator, in an airtight container, until needed. Cheesecakes will keep for 5 days. I love anything with lemons in and these look so good. I can almost taste the tangy lemon as I look at the pictures. Pinned, will make and will let you know how I get on. Using the same ingredients and amount could you use a 9inch tin instead of individual cupcakes? If so how long would you bake it for? Hi Chele. If you’d like a full-size lemon ricotta cheesecake, I have a recipe for you 🙂 Link below! I made these for a dinner party that included 2 people that always claim they don’t like desserts….not anymore! These were a hit and so easy. I will definitely make these again and again. Hi Mary. I don’t have any experience baking with a fan oven so I’m unable to advise on oven adjustments. I think making this recipe in a mini cupcake pan should work OK, but I haven’t tested it myself so I cannot say for sure. I made them and they were a success. If you don´t mind I´m posting them in my blog (mentioning and linking the recipe to yours of course). Spanish followers have to try them. Thanks a lot for sharing all your tips and advices. I made these yesterday and they were amazing. I used the lemon tart filling recipe from the Chez Panisse cookbook for the lemon curd. Ridiculously good. Perfectly sized, too. I did find that I had enough filling to make at least 3-4 more, so next time I’ll make a little bit more crust. I am confused by the “1 cup of graham crackers”. How do I measure a cup of crackers? How much crumbs should I get from a cup of crackers? I usually buy the pre-crushed graham crackers, which are easy to measure. But a cup typically is about a sleeve and a half. I’ve made these many times, and they’re soooo good! Next week I’ll be making them for my 6th graders, but I’m really busy the days before, so I was wondering if I can make them a few days ahead and maybe freeze them? Or do you have another idea for me? Loved your recipe!!! I rarely find one that is perfect just as it is. Will definitely make these again and love the idea of making it in a cupcake size! Can these be frozen. I do I’ve to make me them for or Christmas and am trying to do things ahead of time. Made these tonight minus lemon curd only bc I didn’t have that on hand. Will def. make again. 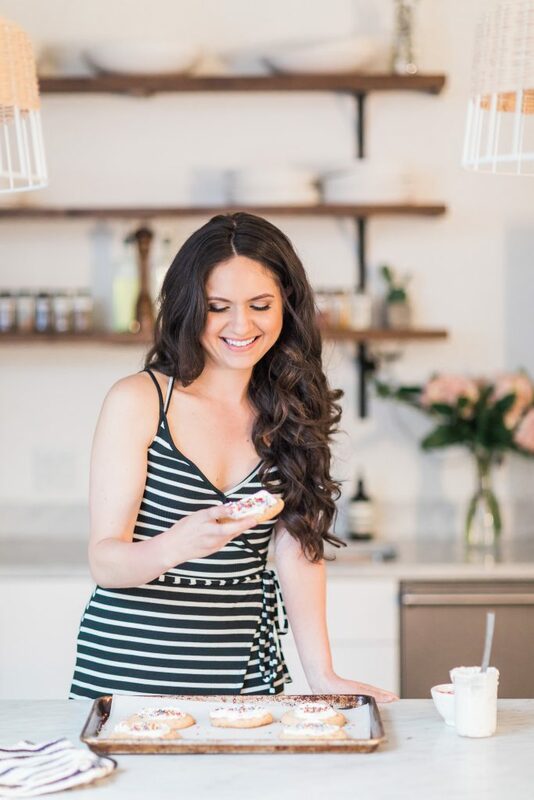 I have been following your posts on IG & Pinterest and glad to have found your website. With these mini cheesecakes, or the Ricotta Mini Cheesecakes can we add lemon zest directly to the cheese mixture for lemon flavor, or would this alter the recipe and how it cooks?